After a failed activation of this reserve a few weeks earlier I wanted to get some contacts for this reserve into the log. The QRP Club’s QRP Hours contest on 22nd October 2017 seemed like a nice opportunity. I set out from Yass about 45 minutes before the contest start as I had a good idea of where I would operate. On site I found I had to be satisfied with a sloping site and I put up the usual linked dipole with all links connected, giving 40m operation. I decided to use the MTR3B CW transceiver for the CW section of the event and use the FT817 for the SSB section. The MTR3B transceiver’s principal characteristic is its compact size and low power usage in particular on receive mode where it is about 40 milliamps, about 1/10th of the FT817. However the inability to conveniently and rapidly browse across the band looking for other stations calling CQ is a limitation for contesting I had not really considered before. Nevertheless I persisted with it to try and find a way to use it best. I had not yet used the Direct Frequency Entry function and I really needed that, so I could jump back to a starting frequency. Also I had not recorded anything in any of the text memories. So during the contest I opened the LNR website and read the instructions for storing text into one of the memories. The obvious thing to have recorded for quick playback is the CQ call. So at least I achieved that during this event! During the CW section I made 5 contacts but of those only one was within VK2 and that was with Mike VK2IG, who with partner Helen VK2FENG was portable in another WWFF nature reserve, not far away from me, but far enough to sound distant. No AGC or even AF gain control on the MTR3 – I have a volume control in the ear buds lead. Other contacts were with VK3, 4 and 5. There was no “normal” NVIS propagation. Very pleased to have worked Warren VK3BYD/5 somewhere in the middle of South Australia, and Grant VK4JAZ who was operating from home in Brisbane. QRP is a combination of frustration and achievements. After a half hour or so, I got a reminder that I was operating in a nature reserve, in the form of a sudden downpour of rain that became hail for about 10 minutes. Fortunately I had suspected rain was imminent and had erected the “sun shelter” shortly after the start of the event. But the slope of the operating location meant icy rainwater was running downhill and under my seat, a small foam sleeve sold for protecting computer tablets and small laptops. Before long the whole site was wet and cold and my clothing was drenched from the waist down. The SSB section commenced at 0600 UTC (5pm local) and after working Helen VK2FENG nearby, Laurie VK5LJ and a few more, I ran out of potential contacts. At that point, a lull in the rain seemed to have arrived so I decided packing up and leaving would be prudent. Half an hour later I was enjoying a very welcome warm shower at home. Fortunately my log is not important for the QRP Hours contest other than a check log, as I am the contest manager. I’m glad I was able to add a contact to a few other logs and in the process I did activate the WWFF park, though with insufficient contacts to qualify for any activation points. That’s ok, this park is near to my home and I will return, hopefully in dry weather. 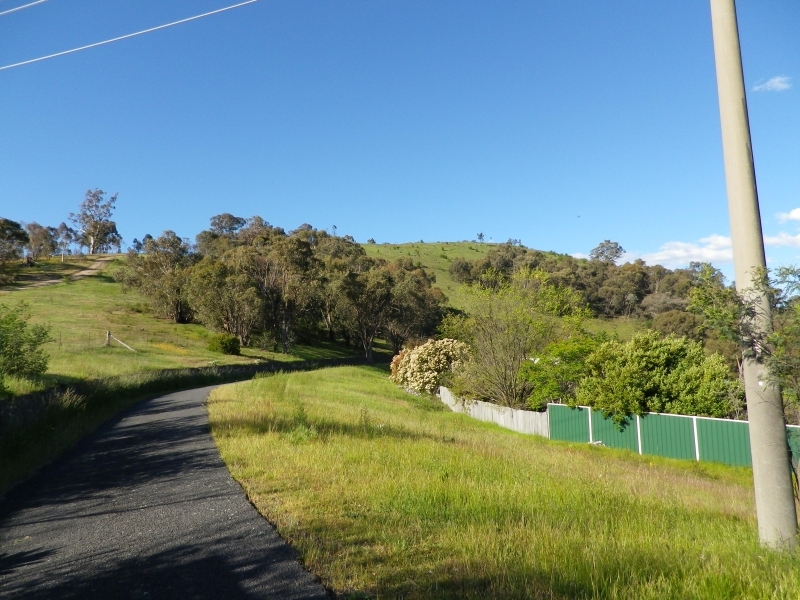 Canberra is known to many as “the bush capital” and this means there are a lot of nature parks interspersed among the suburbs and hills. 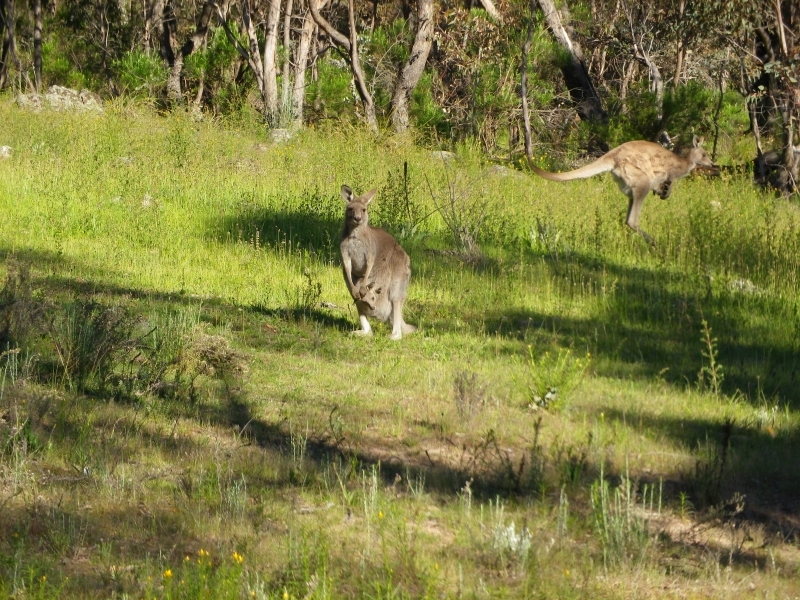 The only National Park in the Australian Capital Territory is Namadgi, which is southwest of the city area, but there are several dozen other nature reserves. 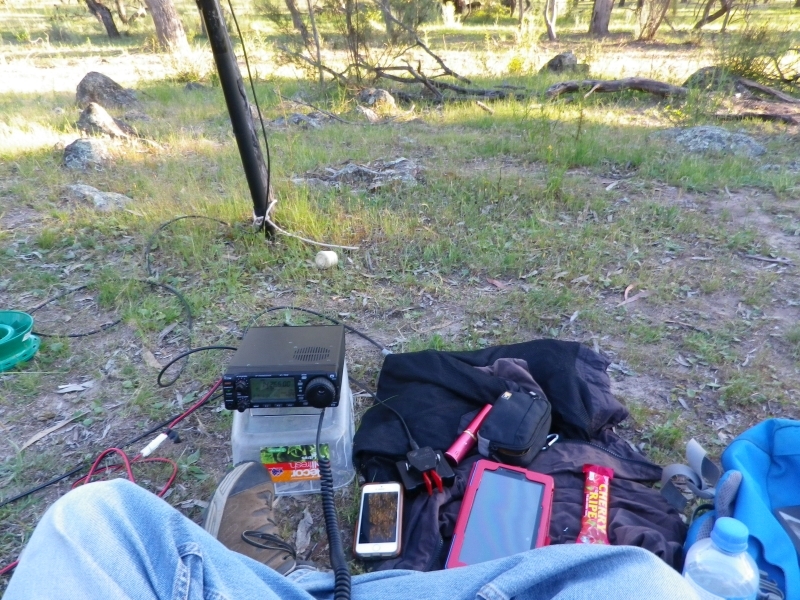 Once they had been given VKFF numbers by the WWFF coordinator for Australia, it became a natural extension of my portable operations around Canberra to add the VKFF number of a park I was in while activating SOTA summits. 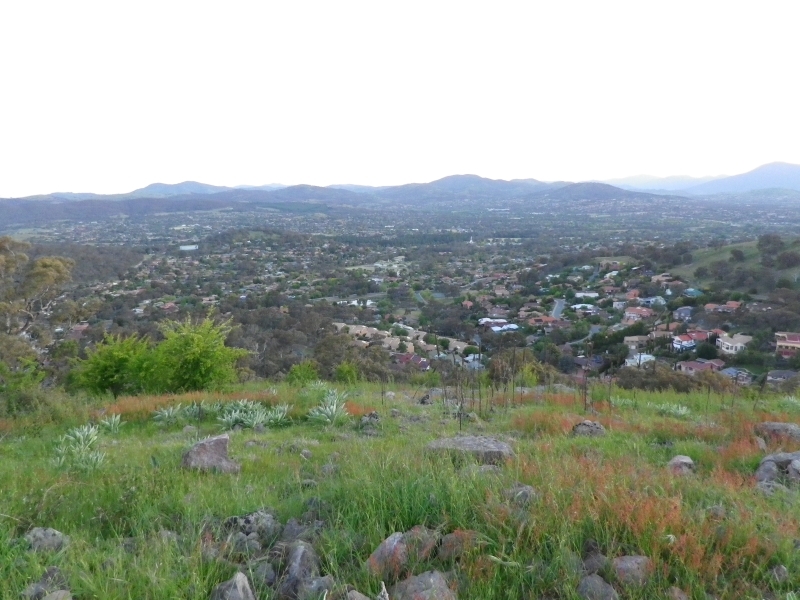 After activating Majura, Ainslie, Taylor, Isaacs Ridge and Tuggeranong as well as Namadgi NP many times due to the number of SOTA summits located in registered parks, it seemed like a good idea to continue to activate parks in the spring weather we are now enjoying (November) between rain showers (it has been a very wet year). 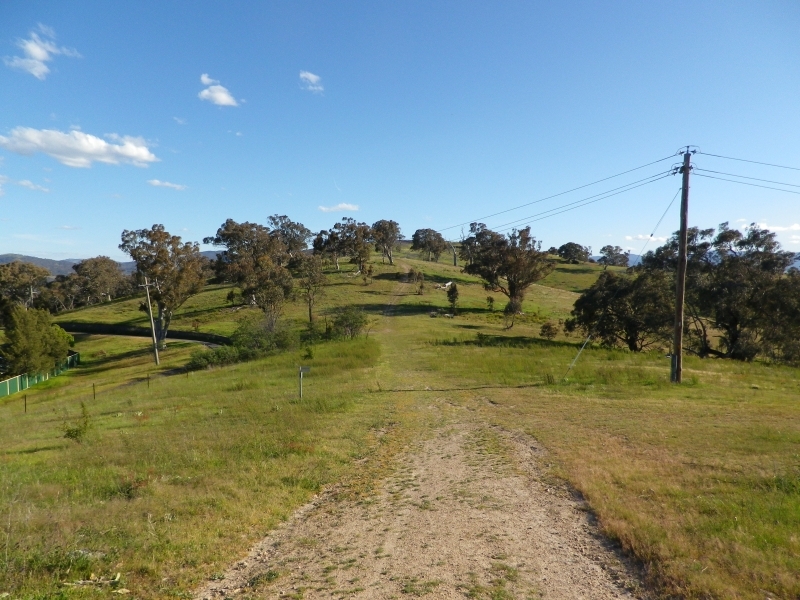 In October and November to date I have activated Urambi Hills, McQuoids Hill, Cooleman Ridge, Farrer Ridge and Wanniassa Hills Nature Reserves, all in the Tuggeranong Valley or adjacent to it. The next reserve activated was Mt Painter nature reserve. All were easy to access, and for the hills you have the option of setting up anywhere within the reserve, not necessarily on the hilltop, though in several cases I was curious to look at the view from the top and did walk up anyway. I was also using these activations as training exercises as I was acutely conscious of losing some of my fitness for SOTA walking due to various injuries during the year. The operating position at Urambi Hills. Photo taken by camera attached to the antenna pole at about 1.2m. The nature park sign at McQuids Hill. Looking back down the hill from half way up. Loose stones, take care here, especially downhill. Lashing the pole to a fairly dead tree. Using the branch to prevent the rope from slipping downwards, just as F1BLL calls me. 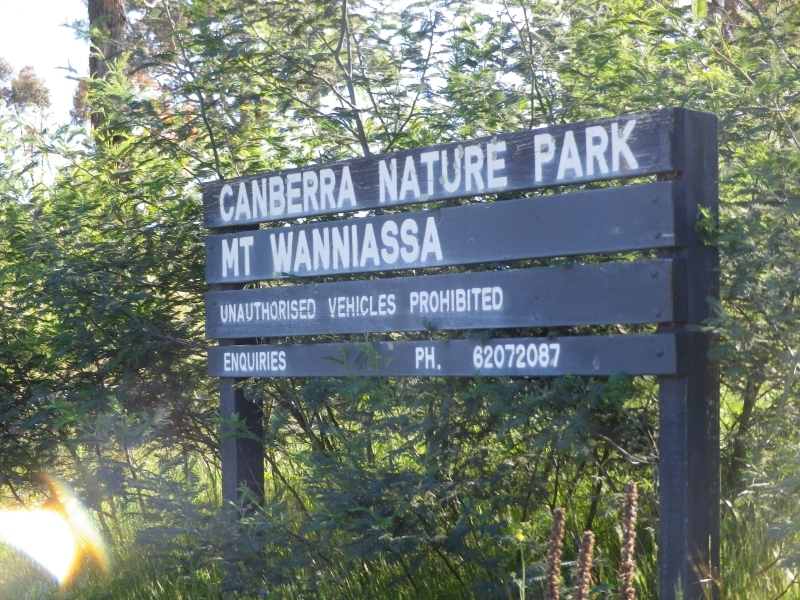 I particularly enjoyed the walk up to Mt Wanniassa, which qualifies as a nature reserve but is not a SOTA Summit. Nearby Isaacs Ridge is slightly higher. But this is a nice mountain and has a great view. After these southside nature reserves I looked at the map and decided that a northside reserve was next. 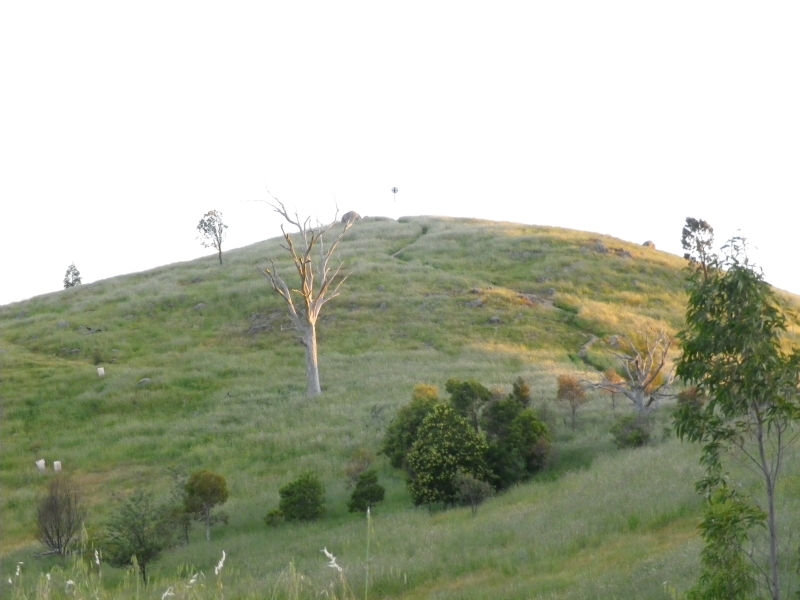 Mt Painter is a hill to the south of the suburb of Cook in the Belconnen area. It was many years since I visited this hill and it was an easy walk up from a roadside park, past the water reservoirs and to this bench with a view of Black Mountain and the lake. On most of these activations I made at least 10 contacts in about an hour, using 40 and 20m bands on SSB and CW. I was hoping for more dx contacts on 20m CW but conditions have been depressed, so it is even more difficult than usual for a 10 watt signal to get all the way around the earth. Gerard, F1BLL did call me on most of these activations and even when very few others seemed to hear me in Europe, he heard and called me. Thanks Gerard, very nice to have your consistent signal on nearly all of my recent activations. Another Gerard, VK2IO, attempted contacts with me from Sydney on many of these activations but the radio conditions simply didn’t give us a chance of making a contact via the very high ionosphere. Equipment used on activations: Icom IC703 at 10w output. antennas supported on a 7m telescopic fibreglass pole. As all the nature reserves are intended for public use, there is no requirement to get permission to enter and use them. 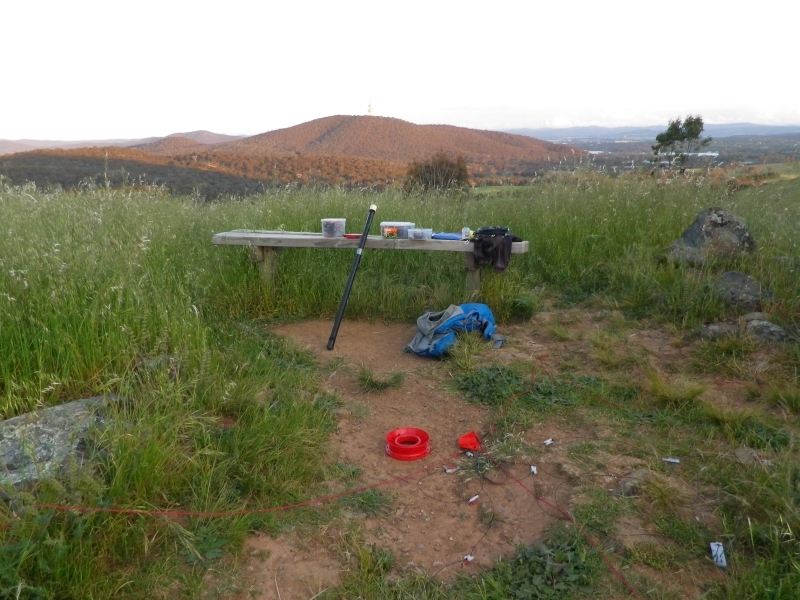 In 2014 the VK1 SOTA group proposed a BBQ and joint activation at Mt Stromlo on 1st Feb, to celebrate the first anniversary of SOTA in VK1. On the day the weather was very hot and the event was called off. 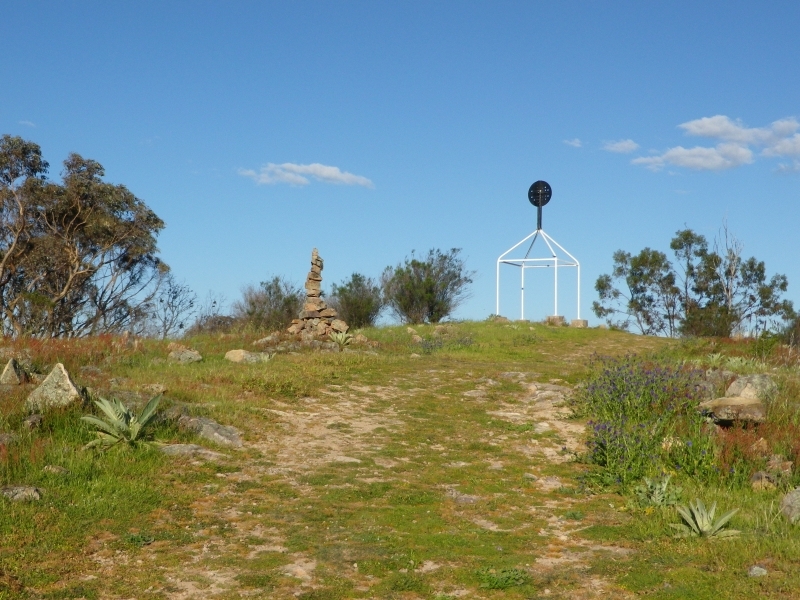 This year the group again decided to have a BBQ at Mt Stromlo, with a joint activation to provide contacts with the summit. 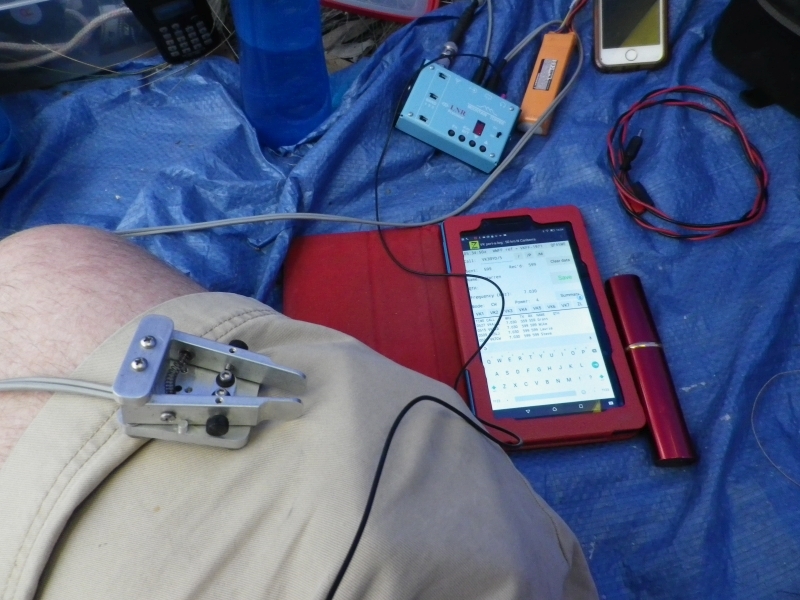 The plan was to have either a lunch or evening BBQ and set up a few antennas to allow the group to make radio contacts. Towards the weekend, it was clear the weather this year was not going to be hot, instead it was likely to rain during the afternoon. Several of the group were unable to make it due to conflicting social engagements so the remaining hopefuls decided to make it a 4pm start and hope for the best re the weather. That turned out to be a mistake as the weather was moderately clear during the day but towards 4pm it looked more like rain every minute. I had borrowed a 23cm fm mobile rig from Compton VK2HRX who was keen to get chaser points for 23cm and was visiting Canberra that day. So I wanted to make at least a few contacts on 2m FM and on 23cm FM. On 23cm the simplex frequency is 1294.0 MHz. I arrived on the mountain earlier than 4pm and spoke with Paul VK1ATP on 2m FM soon after. Simon VK1FAAS emailed the VK1 SOTA group suggesting it looked like a cancellation was going to be necessary and I agreed with that as the weather certainly did not support the event we had hoped for. However after some initial thunder and rain visible to the south, it appeared that the main body of rain had passed us by, so I decided to set up the 23cm antenna and the borrowed 23cm fm radio. Paul had arrived on summit by then and was able to observe the 23cm contacts. After making 3 contacts on 23cm I was looking for a 4th contact so as to qualify the summit on that band. I monitored 2m fm in the hope that someone would call me there offering a contact on 23cm. With the rain apparently having passed and no apparent imminent thunderstorm, I decided to put up the HF antenna and see how badly the bands were affected by the nearby storms. At this point Paul was tempted to do likewise, but after considering his wife and kids he decided against this and departed, wishing me well on HF. The radios under the tarp. The logbook with wet pages. It was only just legible the next day for typing up the log. Running out of contacts on 40m I then decided to look at 20m and higher bands. At this point I also decided to send an email to the VK1 mailing list asking (begging) for anyone with 23cm gear to call me on 146.5 as I wanted a 4th contact on 23cm. 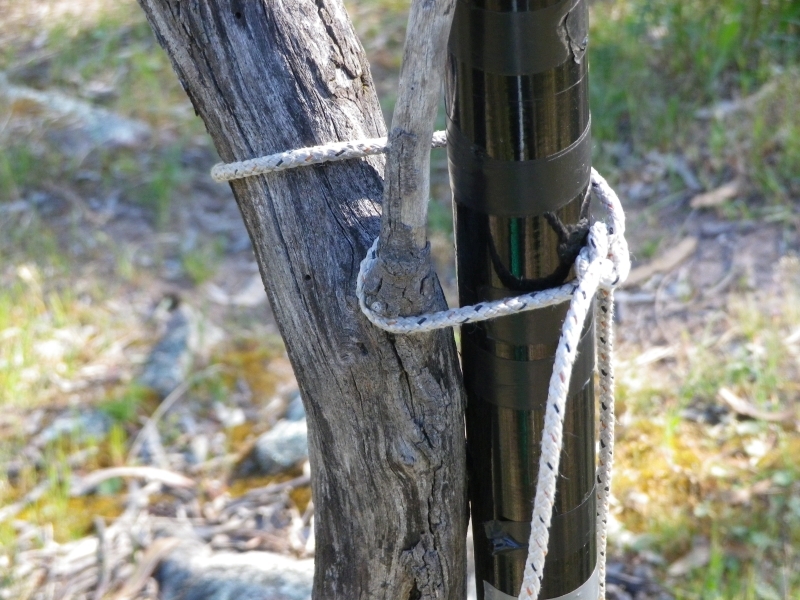 Having moved the HF antenna to 20m by disconnecting the two links I spotted myself on 14.310 and called cq, which resulted in 3 contacts into South Australia (VK5). I did not receive further replies so I looked higher in frequency. On 24.9 MHz I heard a strong KH6 (Hawaii) calling CQ on CW and I thought I should at least try a contact. I received a good (579) report from the KH6 which was great as the antenna was still linked for 20m. Before finishing the KH6 contact I heard Jayson VK1JA calling me on 2m fm. I asked him to stand by a minute while I completed with the KH6. When I went back to Jayson he said he was receiving me well and wanted to try 23cm. We then made a good contact over about 15km to his location in Tuggeranong. After completing with Jayson I removed the 12m link on the HF antenna and made another contact on 24.9 MHz CW with a Japanese station. These dx contacts were completely unspotted as I was answering their CQs. Their power levels were most likely at least 100 watts or 10 db more than my IC703’s 10 watts, and possibly even higher. As an anniversary event it was a fizzer but I got some satisfaction from making the 4 contacts on 23cm and handing out some points to SOTA chasers. Also gained some S2S points from working VK3KAB and VK3YY. As I had some time off work in January I planned a SOTA expedition to activate some summits in the Snowy Mountains region, where there are plenty of high value summits to choose from. I planned to activate several summits on the first day and one major trip on the next day. The first summit activated was the unnamed VK2/SM-053 which is east of the Thredbo road. Others have described it and its location, it is easy enough to find and can be driven up, though the top section of the road has been damaged by roadworks and recent heavy rain. I parked my car on the road near the top and walked to a suitable point where I could see a good location for my radio and a nearby stump that the mast could be attached to. The multiband dipole was soon set up and I was able to qualify the summit within a few minutes of getting on air, on both SSB and CW on 40m. Nothing was heard or worked on 20m and that band sounded quite dead. 20 contacts made on 40m. Driving towards Thredbo afterwards, a thunderstorm passed overhead with heavy rain and I wondered how the weather would be when I reached the next parking spot. The storm passed and soon even the rain stopped, so by the time I reached the parking area at Dead Horse Gap, about 10km past Thredbo, the sky was clear of rain clouds and I was able to get my bike out of the car and get moving towards the Cascades. This summit is to the south of the Thredbo river, but the path along the north side of the river takes you the first 2km of the trip. Then you cross the river either on the steel bridge or via a road crossing intended for forest maintenance vehicles. I decided against riding through the water, it was about 150 to 200mm deep at that point but flowing quite quickly. After crossing the river, you follow the track up towards the hill. I left my bike near the river and walked the next 2km without it. It would have made the return trip much faster if I had pushed the bike up to a higher point. 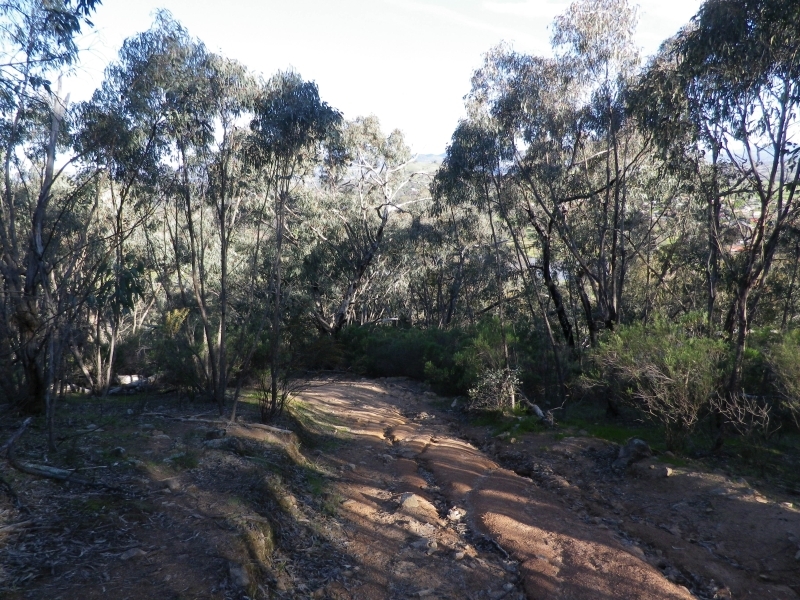 Having reached the highest point on the fire trail/maintenance track at about 2km past the river crossing, it was easy to walk upwards towards the summit through the bushland. Taking care to look out for unfriendly wildlife, I passed the first set of (huge) rocks and my GPS was already indicating that I had entered the top 20m contour so I had to be in the activation zone then. I found a suitable rock to set up my gear on, only later noticing that there was a huge dead eucalyptus tree nearby. Fortunately nothing unpleasant happened but I should have chosen a safer place to sit. Those old trees are called “widow-makers” for good reason. After making the first dozen contacts on 40m ssb, I moved to CW and made more contacts, as part of my aim to qualify each summit I activate on ssb and CW. Signals incoming were ok but the reports I was receiving were well down on the usual level. After moving back to the ssb mode I made more contacts and while talking with Matt VK1MA I told him my antenna seemed to have a fault, and while saying that my gaze went up the pole to where the coaxial cable feedline connected to the antenna wires. I could see one of the antenna wires sticking out into free space and knew I had found the problem. I pulled the mast down, reattached the wire to its binding post and raised the mast again. Matt then reported my signal level had raised from s6 to s9. So I owe all previous contacts my apologies for the low signal, all due to not checking the antenna properly. The same problem was probably affecting signal levels on the previous summit too. 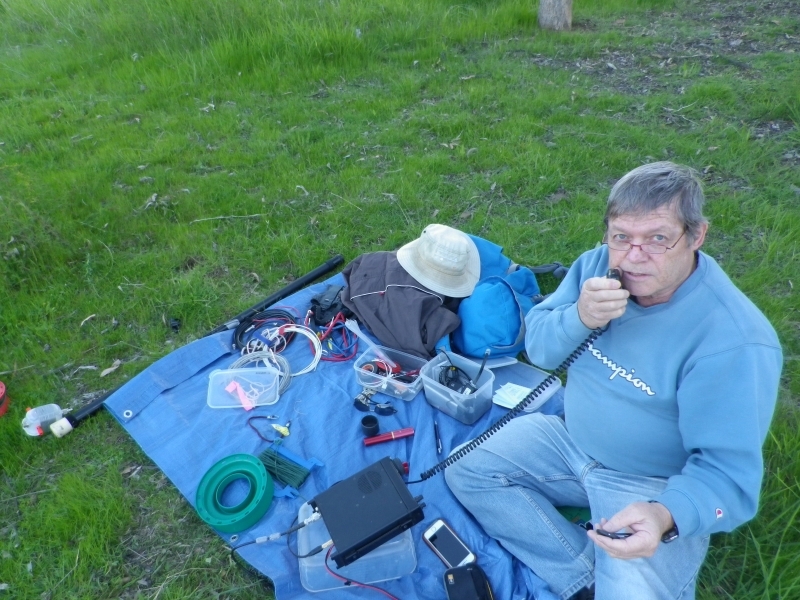 After moving to 20m I made a good contact with Peter VK4JD, who was much stronger on 20m than he had been on 40. Then a contact with John VK6NU and another with John on CW on 14062. I heard a few European stations calling me on CW but none of them responded to my replies, so were apparently calling blind, on the basis of the Sotawatch spot. No contacts occurred from these blind calls. I wonder how often they work. By then it was just after 7pm local time and I needed to pack up and leave, to avoid making too much of the return trip in darkness. It took about 45mins to walk back to my bike, so perhaps it was more than 2km. From that point it was a fairly quick ride back to the car, passing a few brumbies on the way. 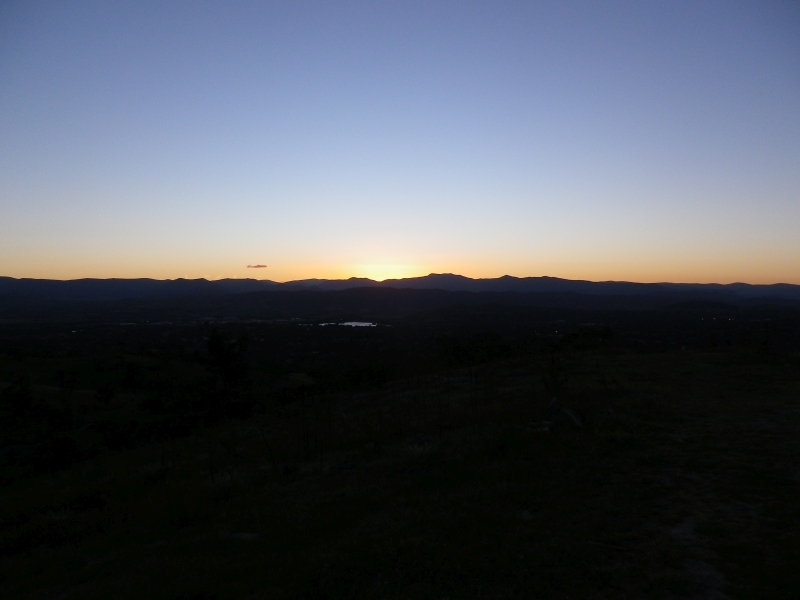 I arrived back at Jindabyne just after 9pm. I arrived at Charlotte Pass at about 9:45 am, somewhat later than planned. With the squid pole attached to the crossbar of my bike, I rode the first 4.5km then pushed the bike up the steeper sections past Seaman’s Hut and up to Rawson’s Gap where there are public toilets and bike racks. Bikes are not permitted past that point. It took me about 2 hours to cover the 7.6km from CP to Rawson’s Gap. I had to walk about 4km of this, slowly, as parts of it were too steep for my bike. I may have been able to ride more of this section with a lower geared bike. Mine is a general purpose road bike with 21 gears and no spring suspension. The gears and tyres are not really suitable for this kind of “road”. From Rawson’s Gap to the top of Kosciuszko is about 1.4 km, climbing about 150m vertically over that distance. Rawson’s is a common point where the track from Charlotte Pass and the track from the top of the Thredbo chairlift meet. After a break there to lock my bike, detach the squid pole and get ready to walk, I set off up the final section of the ascent. My first contact was made at 0218, the last was made at 0351. I used 7mhz for nearly all contacts. The 20m band was sounding almost dead. the only contact made on 20m was with VK4JD. I also made a brief contact with VK2KVP in Murrumbateman via the VK1RGI repeater on Mt Ginini. Other repeaters were heard while the 2m fm radio was scanning around all the memories. 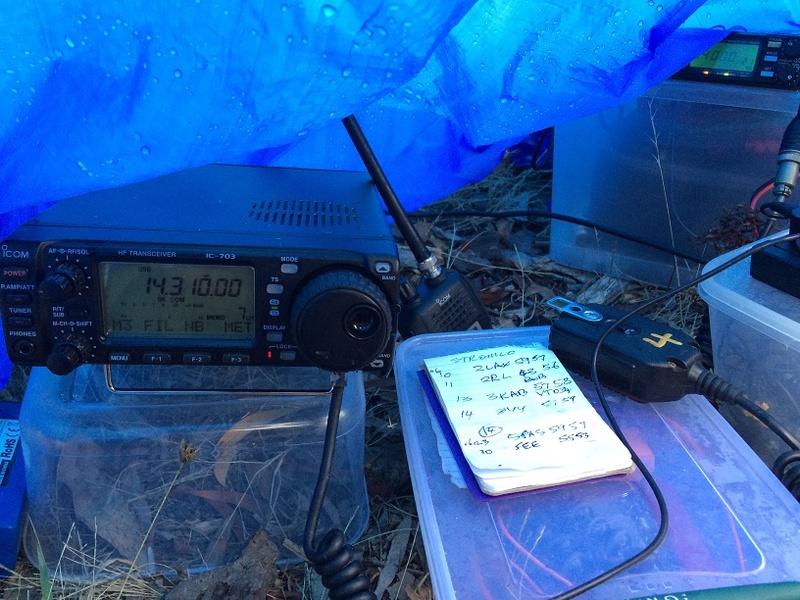 John VK2YW was heard chatting to others in the Wagga area, the Albury repeater was heard a few times. After leaving the summit I noticed the clouds to the north looked particularly dark and I knew there would be some rain on the trip back to Charlotte Pass. I retrieved a jacket from my backpack as part of my preparations for the return trip by bike. As it was all downhill for about 4km past Seaman’s Hut to the Snowy River bridge, then only a short section with a slight uphill slope, followed by about 4km of a gentle downhill slope, the return journey to CP took only about 30 mins. A shower of rain with wind lasted for about half of that journey. Back at the car, I chatted with a friendly couple who had also just returned from Kosciuszko, one of them riding and the other running. They took less than 3 hours for their entire return journey, but they didn’t have a radio to operate on the mountain! It occurred to me later that as Thredbo is at about 1400m ASL and Kosciuszko is 2229, the vertical distance is 830m or so. 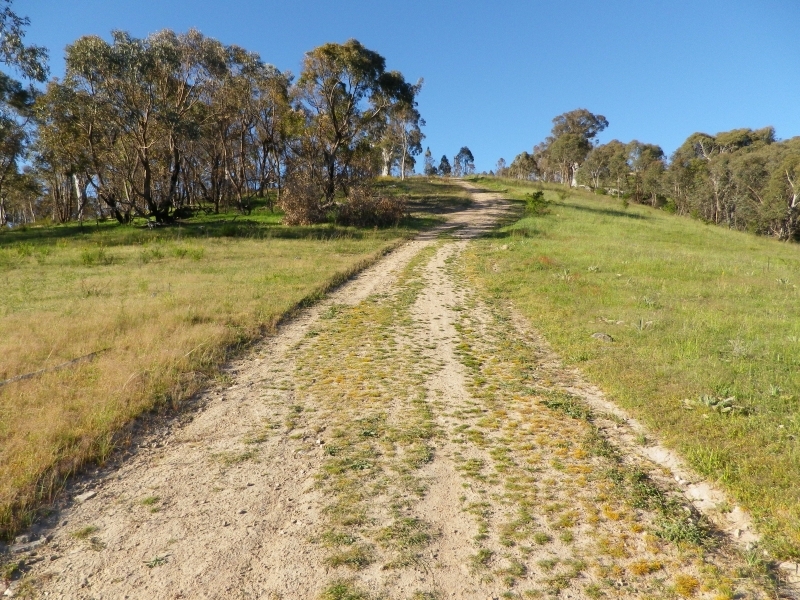 This is not much more than the vertical distance we climb for Mt Tennent in south Canberra, though it is lower altitudes (from about 620 to 1384, or 764m). For someone taking the chairlift at Thredbo, the distance required is reduced by about 600m, making the climb up Mt Tennent more difficult than the trip from Thredbo to Kosciuszko. Over a coffee in Cooma on the morning of 22 Jan, I browsed the summit list and decided to check with Rod VK2TWR how to find this one. He provided the directions and said my car would easily drive up the hill. 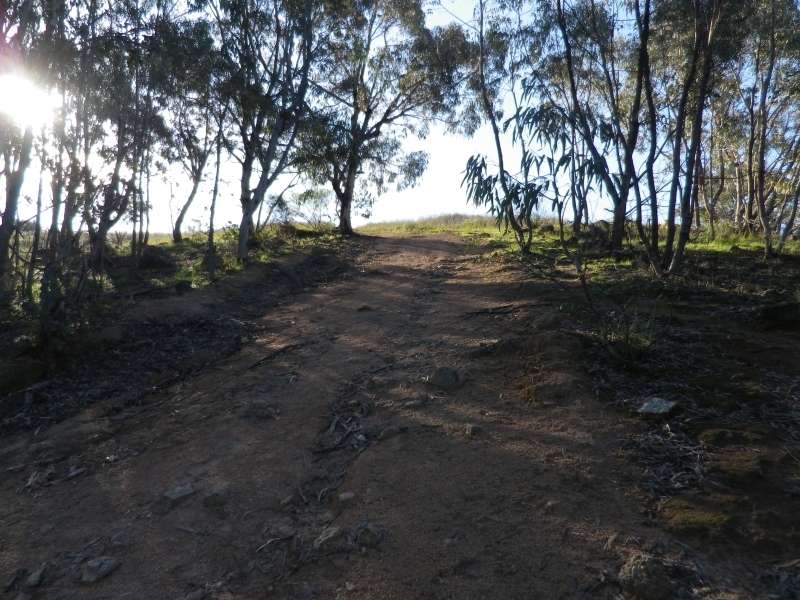 Located about half way between Cooma and Nimmitabel, this summit is reached via about 10km of dirt road, the last 300m being fairly rutted and rough, with many large thistles covering the track and adjacent land. The turnoff is marked with a sign marked “The Peak” at 22 km from Cooma just after a sign indicating 90km to Bega. 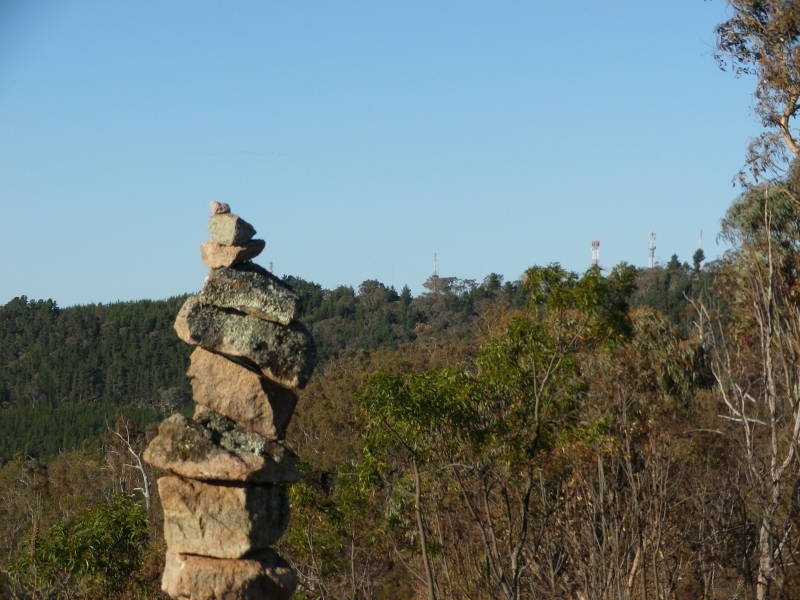 There is a Telstra building and tower on the summit. I parked near the building compound and climbed the final bit up to the trig point. Attached the pole to the trig and operated on 40m ssb and cw, 20m produced contacts with VK5IS, VK4JD and VK5WG. I didn’t qualify this on cw or on 20m, making contacts with only 3 unique callsigns on cw and only 3 contacts on 20m. The SOTA registration for VK1 has been submitted to the SOTA Management Team (MT) and is under consideration and review with them. The hope is to have SOTA-VK1 operating by the end of summer. 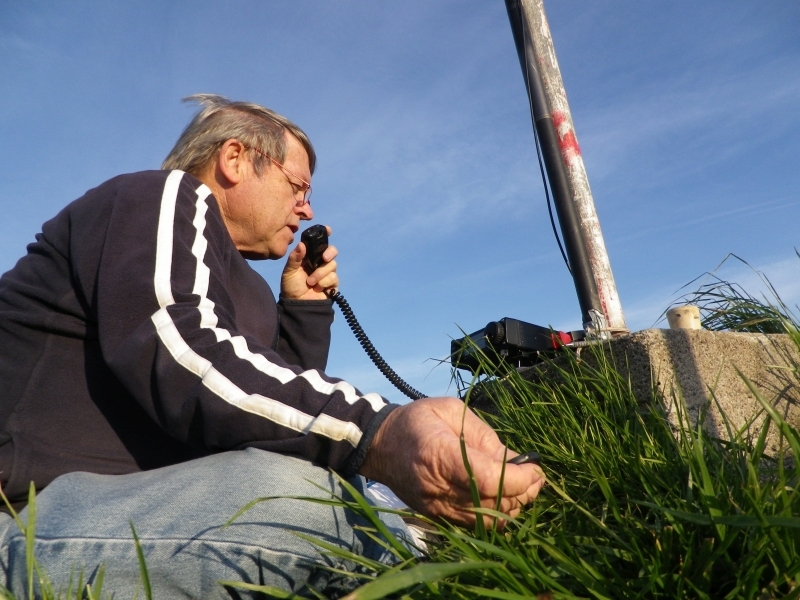 There are a number of keen operators wanting to participate in SOTA in VK1. For VK2 I have agreed to coordinate surveys for the summits in VK2. Jack VK2AXL has surveyed almost 90 summits in the mid north coast area (Coffs Hbr and southwards) and Wayne VK3WAM has surveyed summits in the Snowy Mts area. Ian VK1DI has documented some summits in the south coast region from the border northwards to Narooma. Software has been written by Brenton Schulz VK2MEV to identify potential summits and this should make the process a lot faster. For anyone interested in SOTA and wanting to connect with others, there is a Yahoo group for SOTA in Australia. The link is http://au.groups.yahoo.com/group/SOTA_Australia and you don’t need to have a yahoo id to join the mailing list, but it is recommended as it lets you look at shared files, photos and a database showing progress towards documenting summits.